San Diego Unified Trustee Marne Foster filed a $250,000 claim AGAINST the San Diego Unified School District, and LIED TO THE PRESS AND THE SDUSD STAKEHOLDERS claiming her former partner had filed it according to the father of her two sons says the Voice of San Diego (VOSD). Marsh ALSO said that intimidation and threats of retribution, JUST LIKE THE IMPROPER INTERVENTIONS (ASSISTED BY SUPT. CINDY MARTEN WITH PRINCIPAL MITZI LIZARRAGA AND COUNSELOR KIM ABAGAT AND SCPA TEACHERS AND STAFF) were part of her “persuasion”. “Marsh said he and Foster have two kids together, but they haven’t spoken frequently over the years. Before he submitted the claim, Marsh said he’d been homeless. Foster found Marsh, he said, and offered him a place to stay. The district eventually denied the claim, and awarded no money. No lawsuit was filed. But if Marsh’s story is true, it would mean that Foster obtained the letter – which she was not supposed to have access to – and then used it to file a $250,000 claim against the very school district she was elected to represent. Trustee Marne Foster coerced her son’s homeless father to sign a blank form under threat of being thrown back on the street and then filed a false claim to receive $250,000 based on false charges she made against SDUSD Employees that were punished by Cindy Marten for being honest in their evaluation of her troubled son…and then lied about it to the Union Tribune and ALL SDUSD Stakeholders and the San Diego Unified Board of Education. This is at least the 3rd claim in the past month that has called Trustee Marne Foster a liar and and a political and financial opportunist that uses her power to serve her own wants improperly. District Deeds has been chronicling the misdeeds of Trustee Foster and her accomplice Supt. Cindy Marten since JUNE 2014. ONE WARNING: Marne Foster is a MANIPULATOR. For all we know she coerced Mr. Marsh to tell this story to throw everyone off the trail of her and Marten’s PROVEN misdeeds…which stand on their own as cause for their removal. She did not earn the nickname of MEDDLIN’ MARNE for nothing! DISTRICT DEEDS SAYS: WE HAVE ENOUGH EVIDENCE!!! WE MUST STAND UP NOW! MARNE FOSTER MUST BE RECALLED OR RESIGN NOW! SUPERINTENDENT CINDY MARTEN MUST BE HELD ACCOUNTABLE FOR HER IMPROPER OPERATIONAL SUPPORT OF FOSTER! 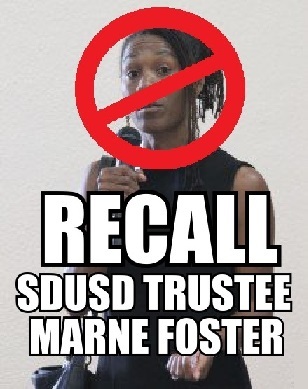 CLICK TO SIGN THE RECALL TRUSTEE MARNE FOSTER NOW! PETITION! Frank, Thank you for all your work and dedication to this topic. I have one comment though, although I am horrified by all of Ms. Foster’s actions, I think the recall “poster” is not the most effective image for this campaign. There is something unsettling about that photo of her, and the red slash. In this day and age, I think it’s important to be careful with words and images. Just my thoughts. Keep up the good work. Hello Robin! I appreciate your feedback and your concern about the poster with the “Not Allowed” symbol. I looked in to it and thought about it for a while and decided that the symbol on Foster symbolizes the corruption, intimidation and harm she has done to numerous highly skilled Principals, Teachers and Staff, to the SDUSD Stakeholders, to the reputation of the SDUSD Board of Education, and to the 130,000 students. I realized that it was a harsh symbol when I used it but the harshness of Foster’s actions in sullying reputations of dedicated educational professionals and actually taking their skills away from our Students warranted a harsh symbol of disapproval. I truly appreciate your comment and I hope you can see how that it represents the misery she inflicted on so many individuals. Practical discussion – I was fascinated by the information – Does someone know where my business could grab a blank a form document to fill out ?